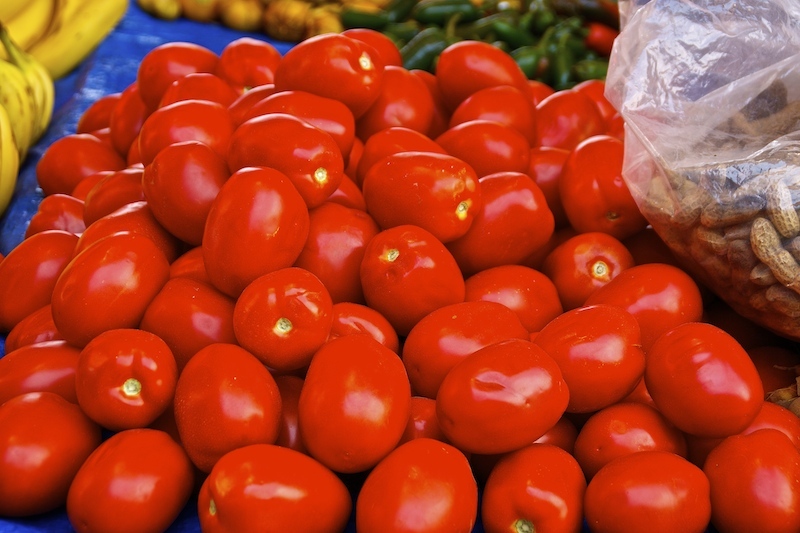 When you visit any of the colorful markets in Mexico you soon realize that tomatoes are an essential part of every Mexican pantry and are used throughout the year in a wide variety of dishes. Be it in the famous salsas or sauces cooked or fresh with different degrees of spiciness, in salads, tacos, quesadillas and other dishes. 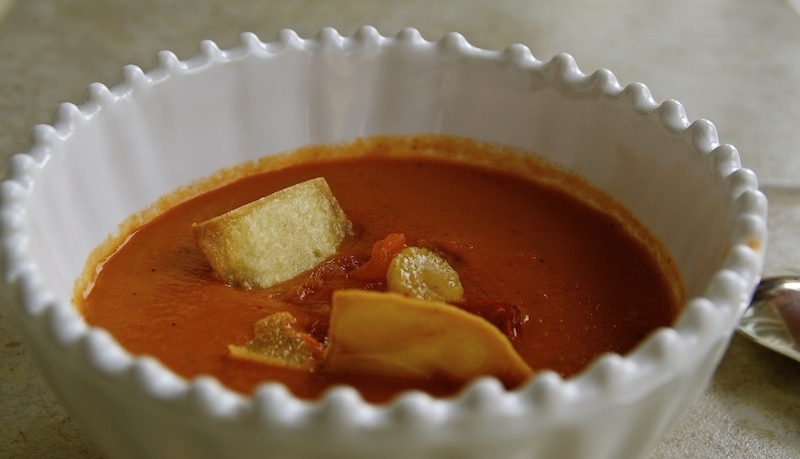 Also as drinks and delicious soups like this roasted Mexican tomato soup. I love the way vendors proudly display the different tomato varieties. Their dark red or green flesh is usually shinning to attract the customer and you’ll find me right there feeling and choosing between the various degrees of firmness depending on my week’s menu. They are usually very juicy and simply delicious. Since we arrived in Mexico our tomato intake increased substantially and has become an essential part of our diet. There will always be fresh tomatoes for a quick salad when I don’t have so much time, even just in a salsa to accompany some dish or in a fresh vegetable soup. The most common types of Mexican tomatoes are the jitomate guaje which is the plum tomato and the jitomate de bola or round tomatoes. For this recipe you will need both. There is nothing like the smell of roasted tomatoes and vegetables out of the oven. This is what gives this wonderful soup character and complex flavour. As I have mentioned before, my husband is not a soup fan. It is always a challenge to find interesting enough soups for him to even consider trying. Tomato soup was always on his blacklist so I was a bit doubtful. Fortunately, the bold flavours did not disappoint and my husband actually said this was the best tomato soup he had ever tasted and that he actually wouldn’t mind eating it again! My daughter also loved it. This a great low fat and healthy recipe, one I’m sure you will appreciate as much as we did. Line a baking tray with cooking spray. Add the tomatoes, the celery, the garlic, the onion and sprinkle with the basil and thyme leaves. Season with salt and pepper to taste. Bake for 20 minutes, mixing occasionally to avoid the vegetables to stick. Remove and reserve 1/2 cup of this mixture to decorate. Blend the rest in two batches with the chicken or vegetable stock. Pour the blended soup into a pan, add the tomato purée, the cream and mix well. In medium heat, cook for 15 minutes until it reduces a bit and gains a thicker consistency. Check the seasoning, adding salt and pepper if needed. 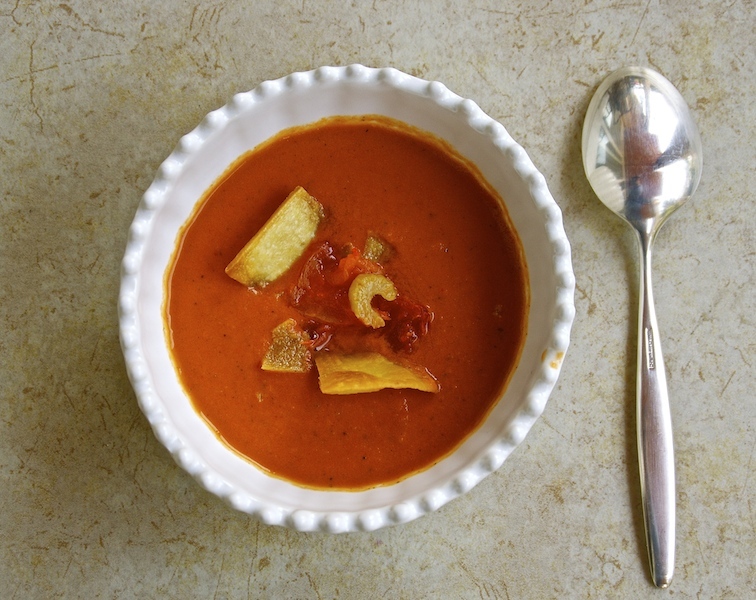 Serve the soup in individual bowls and decorate with the 1/2 cup of the vegetable mix you had set aside and slices of fried tortilla or the croutons. Enjoy! Que rico, ya me dio hambre. Me too! Thank you Carmen!